The Adidas Combat Speed wrestling shoe has an established heritage and is a popular, tried and tested shoe amongst champions. It is the standard to which all other wrestling shoes are judged. Sock like fit meets uncanny support in this ultra-light weight shoe. At 195 grams this minimalist design has plenty of mesh breathability and TPU strip support. 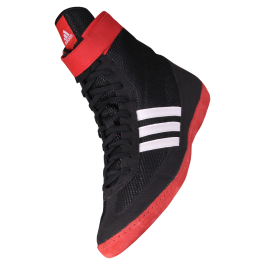 The Adidas Combat Speed wrestling shoe has an established heritage and is a popular, tried and tested shoe amongst champions. It is the standard to which all other wrestling shoes are judged. Sock like fit meets uncanny support in this ultra-light weight shoe. At 195 grams this minimalist design has plenty of mesh breathability and TPU strip support.